Note: since I first wrote this and other reviews of Devdutt Pattanaik's books, I have gained a better understanding of Hindu texts and scriptures. I believe Devdutt Pattanaik's writings are influenced heavily by western frameworks and agendas on the one hand, and introduce subtle and sometimes outright distortions in the interpretation of these texts. A small sample of the kinds of outright errors and distortions that would shame any scholar of Hinduism can be found in this blog post. I therefore do not recommend any of Devdutt Pattanaik's books that I have reviewed on my blog. - Abhinav, Nov 3, 2017. Insightful and readable as all of the author's books, but this one has a somewhat hurried feel to it. The author covers briefly the trinity in Hinduism, Brahma, Vishnu, and Siva. After that the book dwells on Vishnu, looked at primarily from the prism of the avatars of the lord - all ten of them, the Dashavatar. 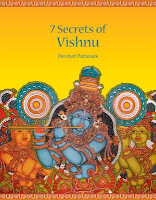 The most fascinating chapter is the first one, "Mohini's Secret, which describes how Brahma, Vishnu, and Siva are connected to each other. Each avatar is unique, each the result of the needs of the time, and each with its learnings. The avatar of Narasimha avatar is a powerful reminder of the limitations of the human imagination, as Hiranyakashyap learns. The Vamana avatar and the Bali episode teaches us about the human ego. We are so consumed with a sense of our own importance, so much so that we are deluded into thinking we are omnipotent. Three paces of land is what Vamana asked for, and three paces of land is what Bali, the all-powerful king and grandson of Prahalad, could not provide.